MULTIPLE, PORTABLE AND USE IT ANYWHERE! ANYTIME! 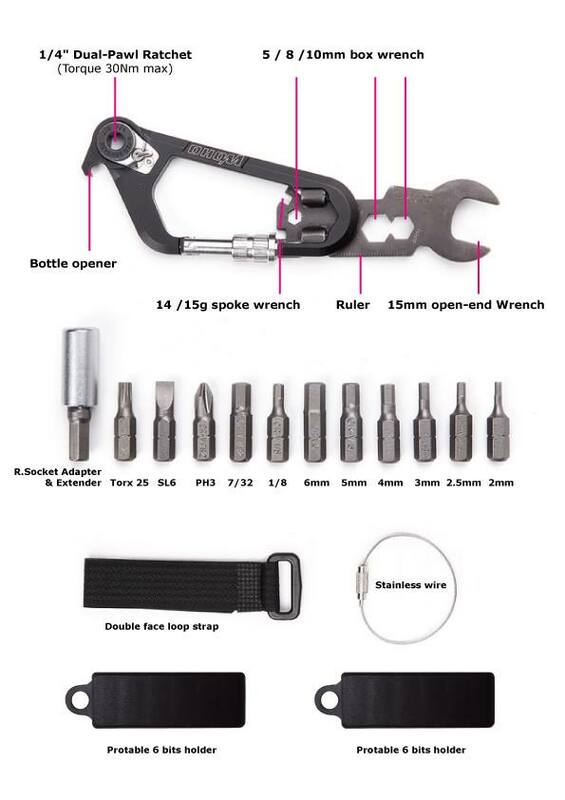 WOKit™ - The carabiner multi-tool includes a rotating ratchet, coupled with 9 different sized hex tool heads, allowing more functionality. The most important feature of the tool is the beer bottle opener arranged on the top of the carabiner. The head tool piece is a 15mm wrench which can easily remove pedals or hubs. In the middle there are 5 / 8 / 10mm enclosed hex wrenches, and on the end of the pieces there are two kinds of surfaces (14 / 15g spoke wrench). The tool also has a laser engraved metric scale. The project launch on Kickstarter before!